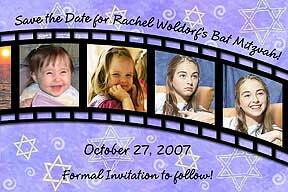 Photo Bar Mitzvah Save the Date Cards - Photo Bat Mitzvah Save the Date Cards ! "I just had to email you with my thanks for doing such a great job on my daughter's photo bat mitzvah save the date cards. Not only are the cards beautiful, but your customer service is outstanding. Thanks for all your help." 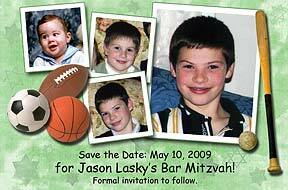 "We must have looked at every website that had photo bar mitzvah save the date cards, and thought that your company had the best designs. We are really pleased with the outcome. Everyone who has received one has commented on how nice they are. We will definitely be back in two years to order more save the dates for our youngest son. Thanks so much." - Carol C.
"I am very impressed! 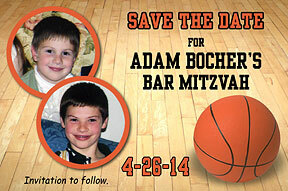 Brett's photo bar mitzvah save the date cards turned out so nice. When I opened the package I was amazed that they look even better than the proof you emailed. You outdid my expectations! I am sure that everyone who receives them will love them." 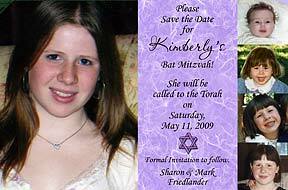 - Sharon F.
Our photo bar mitzvah and bat mitzvah save the date cards are unique, personalized designs you won't find anywhere else. We take several of your photos to create outstanding, one-of-a-kind bat mitzvah and bar mitzvah photo cards especially for you. These photo bat mitzvah or bar mitzvah save the date cards are stunning, archival quality, real photographs, with accompanying envelopes. They're guaranteed to be a fun announcement of your son's or daughter's upcoming event and will become a keepsake for everyone who receives them. Ticket Photo Save the Date Cards© Send us 3 of your favorite photos with your message and personalization for bar mitzvah and bat mitzvah. Soft Bloom Photo Save the Date Cards ©Send us 3 of your favorite photos with your message and personalization for bat mitzvah. Sports Photo Save the Date Cards ©Send us 4 of your favorite photos with your message and personalization for bar mitzvah. 5-Photos Photo Save the Date Cards© Send us 5 of your favorite photos with your message and personalization for bar mitzvah and bat mitzvah. Background colors available: lilac (shown), blue, green, pink. (Please indicate which photo you want to use to use for the large, featured photo). Torah Photo Save the Date Cards ©Send us 4 of your favorite photos with your message and personalization for bar mitzvah and bat mitzvah. Movie Marquee Photo Save the Date Cards© Send us 2 of your favorite photos with your message and personalization for bar mitzvah and bat mitzvah. Basketball Photo Save the Date Cards ©Send us 2 of your favorite photos with your message and personalization for bar mitzvah and bat mitzvah. 6-Photos Photo Save the Date Cards© Send us 6 of your favorite photos with your message and personalization for bar mitzvah and bat mitzvah. Choose any color for the center square. All black and white photos available - we will convert photos, if desired. 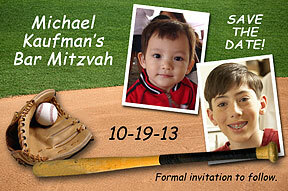 Baseball Bar Mitzvah Save the Date Cards ©Send us 2 of your favorite photos with your message and personalization for bar mitzvah. 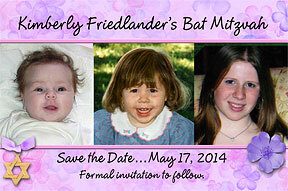 New 5 x 7 inch photo bar mitzvah save the date cards. 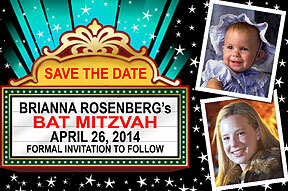 Messages on above bat mitzvah or bar mitzvah photo cards are only suggestions. You may change the wording to create your own, personal message. Look at the sample text used in the card of your choice as a guideline to how much text can be used. 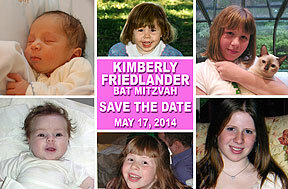 We always email you a proof of your photo bar mitzvah - bat mitzvah save the date order within a couple of business days of receipt of your emailed photos and order information. This is so that you may check it for accuracy, and we only send your order to production after we have received your approval. Please check your email often for your proof to avoid unnecessary delays. If you have not received your proof within 2 days, please contact us and we will resend it. Minimum order is 25, but you can order any amount after that. Many photo save the date card companies force you to order in packs of 25, (25, 50, 75, etc.) but you can order from us 38 or 52 or 112 - or whatever is exactly the amount you actually need. 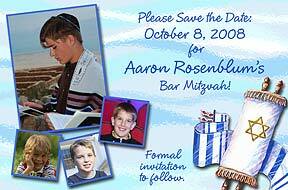 Sample of a past bat mitzvah or bar mitzvah photo card order can be obtained if you send us $3. We will mail your specified design sample and size choice (4 x 6 or 5 x 7), along with a coupon for $3 off, if you decide to order. 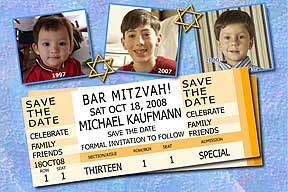 We also have photo bar mitzvah and bat mitzvah favors available, such as photo bar mitzvah bookmarks and photo bar mitzvah magnets. EMAIL your high resolution jpg photos to PhotoPartyFavors@aol.com. When emailing more than one photo for photo save the date cards, you may email them together, or in separate emails. When emailing them separately, please make sure you list your name and what you are ordering with each photo. Please include your name, shipping address, phone number (in case we have any questions), what you're ordering, how many, the last possible date you need it by, the personalization desired, and confirmation that you have mailed (or will be mailing within the next 24-48 hours) your check made payable to Linda Kling.